If there's one thing I love and that's a pair of printed trousers. 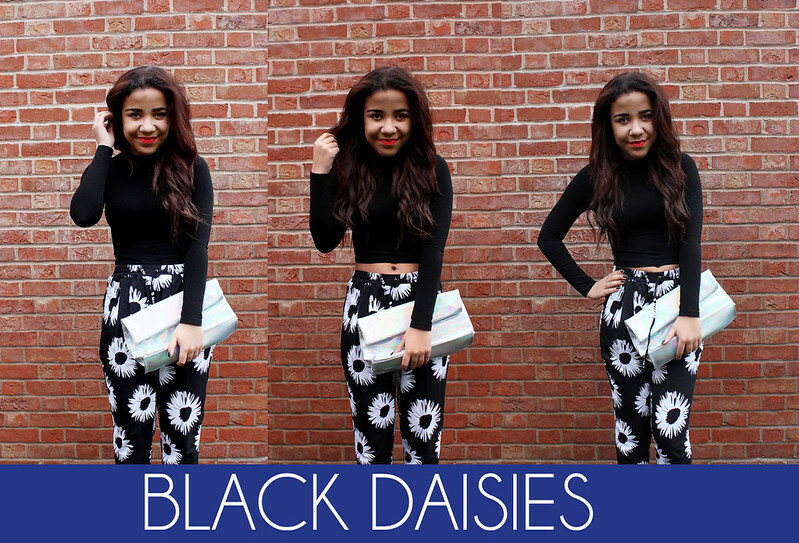 These Daisy Print Trousers are a favourite of mine. I love wearing these as they are so versatile! I bought this turtleneck crop top a while ago and I absolutely love it. I think it looks great with these trousers! This top looks great with shorts, leggings and high-waisted skirts. I love how well this top goes with the trousers. Lady Danger by MAC - Debenhams I've teamed this outfit with one of my favourite lipsticks Lady Danger by MAC and one of my clutch bags which I love which is this holographic clutch from New Look! On my face i'm wear MAC's studio sculpt with Rimmels Stay Matte Powder topped off with my favourite highlighter which is Glow by Topshop. This outfit is a great outfit for going out for a meal in or evening out. I think it's great during the day with a pair of chelsea boots and a colourful coat like this one! gorgeous outfit, the trousers are amazing! Really like the trousers, the print is perfect for spring.